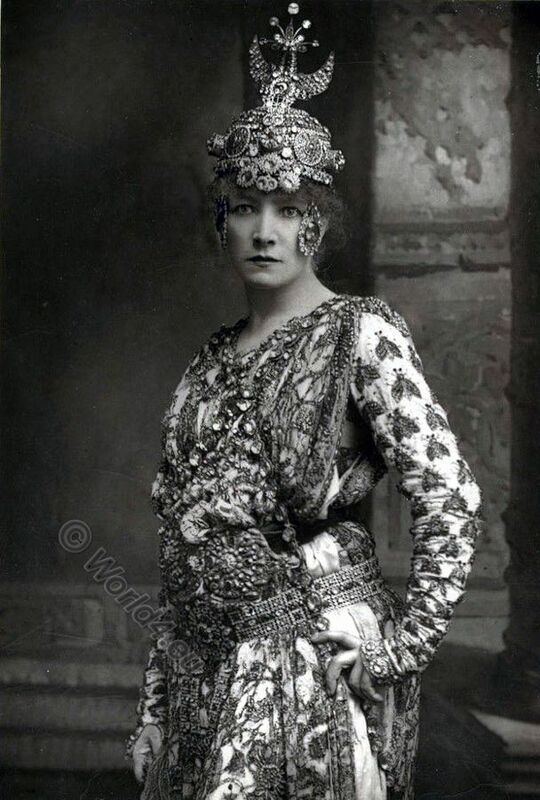 Sarah Bernhardt was praised for her beautiful voice, the grace of her movements and her temperament. She represented in completing a theatrical style that was also past soon after their time, a romantic exuberant declamation and large gestures. Her talent for an emotional drama gave her the opportunity to convince herself as a great tragedian in classical French dramas as well as in modern society. She also gained admiration through her presentation of male roles. In 1899, she played the Hamlet in Shakespeare’s tragedy, 1901 the Duke of Reichstadt in L’Aiglon. But the central role of her life was that of the Camille in The Lady of the Camellias “La dame aux camélias” in the play of Alexandre Dumas the Younger. She was the daughter of Julie Bernardt, a Jewish Dutch woman. Until her eighth year, she was taken care of by a child-girl, then she came to a boarding school and at ten years to a monastic school in Versailles. An essential part of her artistic work – and a prerequisite for their worldwide fame – had extensive concert tours. England’s Queen Victoria and Russian Czar Alexander III. belonged to their admirers. She was regarded as an eccentric, often overstretched and capricious woman, and had numerous lovers, including Charles Haas, the actor Mounet-Sully, and the painter and illustrator Gustave Doré. In addition to novels and plays, she wrote her memoirs in 1907 (Ma double vie. Mémoires. Charpentier et Fasquelle, Paris 1907). In this way, she inspired Marcel Proust, who designed the figure of the actress La Berma after Sarah Bernhardt in his novel “In search of the lost time” and the main character Swann after her lover Charles Haas. Apart from writing, she also showed talent in painting and sculpture. In 1906 she was a professor at the Paris Conservatory, in 1914 she became a member of the French Legion of Honor. Sarah Bernhardt died on 26 March 1923 in Paris. She is buried in the cemetery of Père Lachaise in the east of Paris. Bernhardt is one of the first artists to appear in the then newly emerging medium of film. These are partly preserved today.